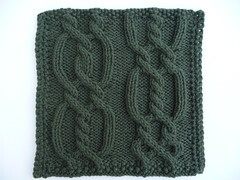 I worked this cable with alternating cable positions as you can see if you compare the picture of my completed square to the original pattern. Oh and I didn't do a very good job of following the pattern like this; which is one reason why I don't like the finished pattern. If I were to do this again, I would just work one pattern across the square and have the rest a plain background. Oh well. I also miscalculated the number of sts and rows I'd need so I had to crochet on all sides. oops.